Lord, today our prayers turn toward Amazonia, where flight regulations have brought about some serious concerns for indigenous residents. 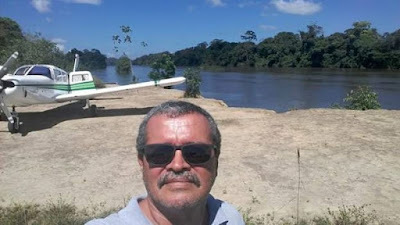 First, we pray for the flight taken by pilot Jeziel Barbosa de Moura in December. We know Jeziel and his seven Amazonian Indian passengers encountered adverse conditions and needed to make an emergency landing, but that is the last anyone heard from them. Despite a two-week search by the Brazilian Air Force and several more weeks’ searching by friends and relatives of the lost, there is no sign of the aircraft or passengers. You know where that craft landed. We pray for the airplane to be found so that people can have closure. If there are any survivors in the wilderness, we ask you to sustain them and get them to help. Lord, we also pray for the larger issue of the lack of air traffic control in the Amazon and other remote parts of Brazil--which disproportionately affects its indigenous population. We pray for airstrips to be upgraded so they can become legal, and thus pilots can fly without subterfuge. We pray that the Civil Aviation Authority will make good on the ruling passed six years ago requiring it to do just that: upgrade airfields. We also pray for other solutions for those Amazonian residents who are required to take dangerous flights in order to collect pensions. Lord, we know this situation is complicated. We do pray it will be prioritized so that solutions can be found and efficiently implemented. In Jesus’ name we pray, amen.